For older LGBTQ individuals, times have certainly changed. Most came of age in an environment when being out and being yourself carried serious risk. And while we’ve come a long way toward accepting and welcoming LGBTQ individuals in many walks of life, barriers still remain, and the senior housing industry is no exception. That’s especially important given projections that there will be 7 million LGBTQ Americans by 2030. On their own, some in the senior housing industry have begun to welcome LGBTQ seniors into existing facilities- for example, check out the LGBTQ & Allies Support Group at the Hebrew Home in Riverdale. And in the last several years there’s been the rise of retirement communities specifically geared toward these seniors. For example, in Palm Springs there is Stonewall Gardens and in Sonoma, the Fountaingrove Lodge. And there’s even a National LGBT Housing Initiative that works on developing affordable and welcoming long term care options for LGBTQ seniors. But it’s not all a bed of roses when it comes to open and accepting senior housing options. Only 21 states and localities have fair housing protections based on sexual orientation and gender identification, and recently, a Federal Court in Missouri ruled against a lesbian couple, together for 40 years and married for the last 10, who were denied entry into a retirement home because the facility did not condone homosexuality. So, progress is slow and uneven at best. 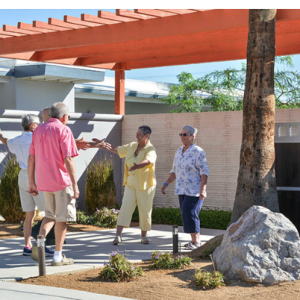 For LGBTQ seniors, who may be estranged from family and less financially secure in retirement, more welcoming and affordable senior housing environments can’t come soon enough.